Suggestions and ideas of our customers inspire our creative abilities. Customers, suppliers and employees are welcome to join in our technological developments allowing us to achieve our objectives rapidly and efficiently. Since 2003, our yarn qualities can be demonstrated to our customers with a trendy Fein-Elast collection. We are constantly experimenting with new developments in fashion and technology. Seamless articles and tights with creative patterns and elastic materials are produced on Matec and Santoni knitting machines. Here, we bring the finest yarns - inspired by the latest fashion trends and aesthetic aspects - into play, so that we can present our new ideas as finished articles to our customers. 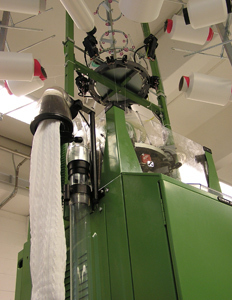 Furthermore, Merz knitting machines are used to test the properties and elasticity of items destined for medical applications prior to presenting these yarn qualities to our customers. Our creative centre offers customers the opportunity to personally convince themselves of our innovations and research work. This allows to guarantee that only the very best developments will reach the customers and that we really live up to their high demands.